Our study area for the community diagnosis was Lamatar VDC, Lalitpur. It lies 10 km North-East to the district headquarter of Lalitpur. To the East of Lamatar lies Ryale VDC of Kavrepalanchwok district. Luvu VDC lies to the West. 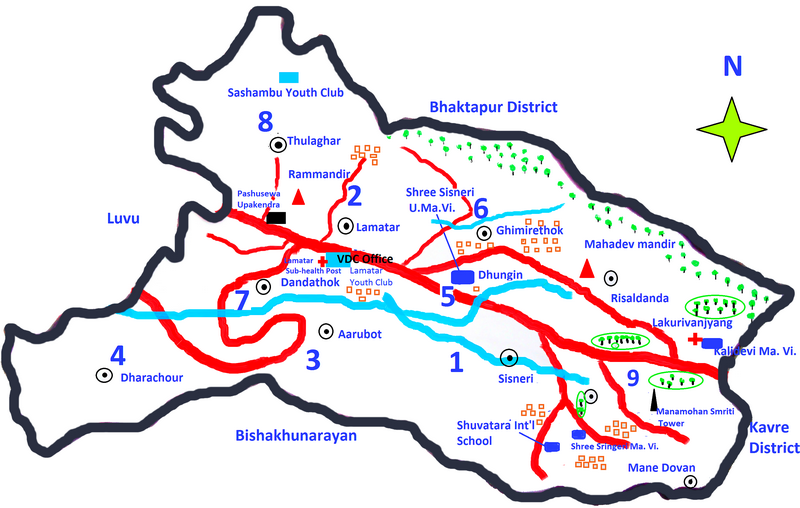 To the North lie Dadhikot, Sirutar and Gundu VDC of Bhaktapur. Bishankhunarayan VDC lies to the South of Lamatar VDC. It has typical climatic feature as of Kathmandu valley with slightly low temperature. The temperature ranges from 10 to 14 °C during winter and 15 to 30 °C during summer. Snowfall occurs in the hills in winter and good rainfall occurs in summer. The VDC has s total population of 7572 according to the census 2058 B.S. Out of which 3805 (50.25%) are male and 3767(49.75%) are female. There are 1497 households. 29.66 % of people in Lamatar are Chhetri, 27.69 % are Brahmin, 15.21 % people are Tamang, 10.75 % are Newar, 3.68 % are Sarki, 2.1 % are Magar and 10.93 % are others. 72.52 % people used Nepali as mother tongue, 15.27 % used Tamang, 10.76 % used Newar and 1.45 % used other languages. This VDC has 73 % literacy rate. Among the sample households, 55.11% of the families in Lamatar VDC are of joint type, 42.28% of are nuclear type and the rest are of extended type. Agriculture is the main occupation in the VDC. With exception of some parts of Ward No.6 and 9 and forests area most of the area (380.44 hectares) are suitable for farming. People adopt farming with seasonal crops. Major crops are paddy, wheat, maize and millet. Likewise seasonal crops include vegetables and fruits. People are also involved in other occupations such as service, business, agriculture etc. Lamatar VDC is surrounded by forests with wide variety of plants. Using the concept of community forests people have been utilising the forest resources like grass, timber, fodder and pastures. Similarly they have been conserving wide variety of plants like Uttis, Katus, Gurans, Salla and Chilaune. There is blacktopped road from Lalitpur to Lamatar. Buses take 30 minutes from Gwarko to Lamatar. A sub-health post, which is staffed with auxiliary health worker (AHW), village health worker (VHW), is located at ward no.2 of the VDC. Another sub-health post is present at ward no.9, Lakurivanjyang staffed with an HA. There are six schools out of which one is a private school. There are no big markets in the VDC except for some small scattered shops. People have to visit other places like Luvu and Patan for shopping. Some places like Dhungin, Lamatar, Dharachour and Thulaghar have been slowly turning into market areas. I was searching about the Lamatar to visit for my holidays. This post helped me a lot to know about the place. Thank you. i'm a people of lamatar village. i request you all if you like to visit here and there then lamater is perfect destination for hiking, cycling, trekking and many more.